I haven’t been putting up any posts for a while. A lot of it is burnout and a lot of it is “been-there-done-that”. To be a little more complete, I’ve explored a lot of Manhattan and seen a lot of stuff. 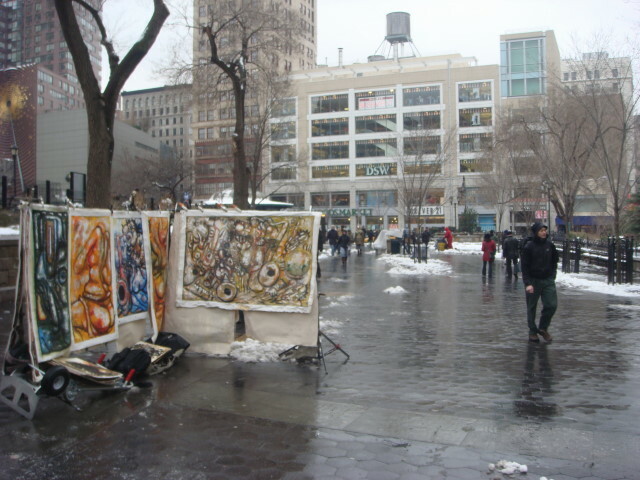 My old favorite place, Union Square, became very boring over the past year or so when it became nothing more than a farmers market and all the strange stuff was just pushed away. I’ve said before that “there’s always something going on in Union Square”, but that hasn’t really been the truth for a while. It got boring…at least for me. Something new happened today though. Small, but just wonderful. 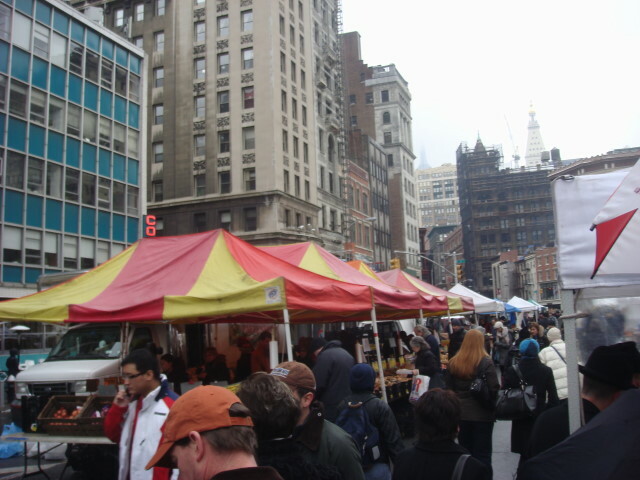 I went down there just to get out of my place and saw that the farmers market had been pushed back to its old area on the west and north side of the square. That was pleasant. In its place were a lot of artists selling their wares (pretty much the standard of before) and a really nice jazz combo. I looked around for a while, but ultimately didn’t see anything that grabbed my attention. The music was pleasant, but the art was same-old, same-old. But then, I’m not much of an afficianado and there could be a dozen new Van Goghs and I wouldn’t know the difference. But after I circled the square, I found a real treasure that I could appreciate fully and wholly and I didn’t stop smiling for half an hour. On the east side of the square, right next to about a dozen garbage bags awaiting pickup was a very pleasant and young Japanese fellow (I discovered his nationality later). He was dressed…unconventionally. Okay, he was dressed in a way that you do see on the streets of NYC a bit, but not often. 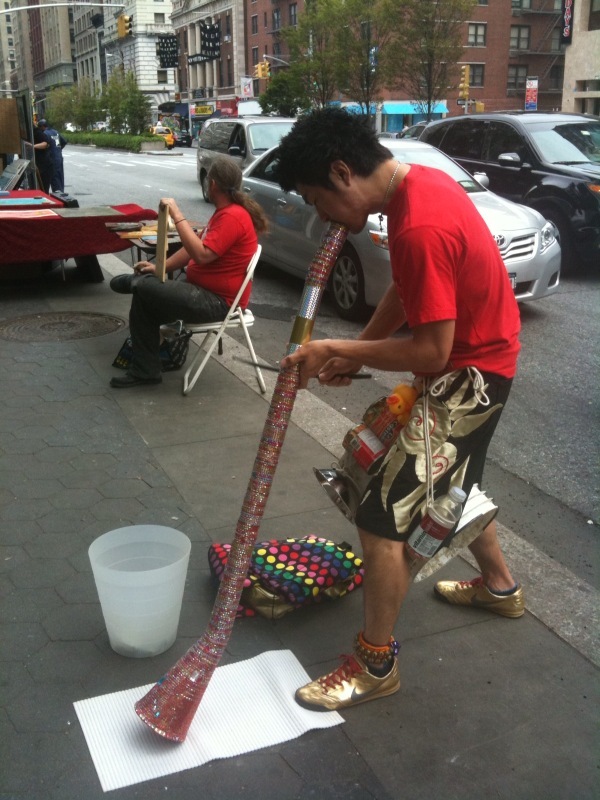 He was wearing a kilt (not too unusual), he was wearing very bright gold sneakers (pretty unusual), and he was dressed with all he needed to be a one-man-didgeridoo band! Yes! Uniqueness at long-last! You know the didgeridoo: the long horn played by Australian Aborigines. It has a very deep and haunting sound. This guy’s playing wasn’t haunting; it was joyful. It was wonderful. He wasn’t playing any music you’d recognize, more along the lines of just playing a beat and freestyling it. And he wasn’t limited to his long, brightly sequined (yes, worthy of playing alongside Liberace), hand-made horn. 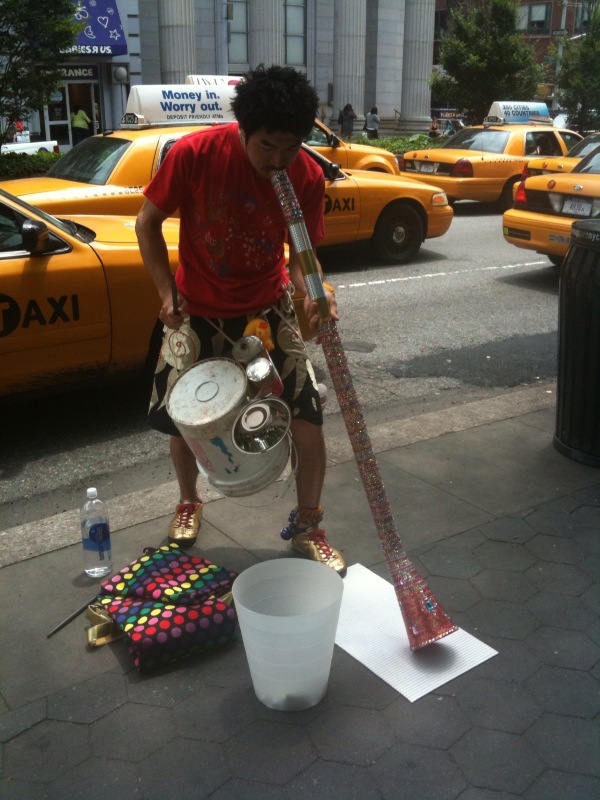 In addition, he had a 5-gallon paint bucket for drumming, two tin cans for also drumming, one metal bowl for drumming, a can filled with rocks for castanets-type-action, bells attached around his ankle, and (most perfectly) a rubber duck. Okay, it was three rubber ducks but he only played one of them to squeak at just the right times. Okay, I’m going to add a second picture at a worse angle, but you can see the rubber ducks better. I was so delighted by it, I called Cuz’n Cathy and let her hear a bit of him. I stood around with a crowd that varied from about 4 to about 20 listeners. The guy had lungs of steel! He went on for at least 10 minutes, probably almost 20 minutes. Didn’t stop, barely seemed to inhale. At the end of it, he was peppered with questions including where he was from and where he got the didgeridoo. He said he made it himself and he just likes playing the didgeridoo. I don’t know what he’s doing in Union Square (other than playing some really nice music), but I figure he’s a student at either NYC or maybe Julliard. 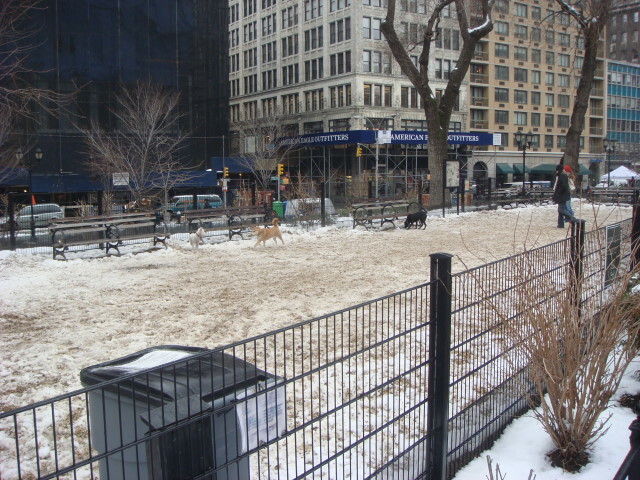 But, then, I usually only have seen the Julliard guys playing in Central Park. Hey, in either case he shouldn’t just be learning, he should also teach this instrument. I don’t think I’d mind seeing this kind of playing a lot more often. As for myself, I just learned that Union Square can still be interesting. I couldn’t help it. I was at Union Square and noticed two things that I hadn’t seen there before. Well, the title tells it all. 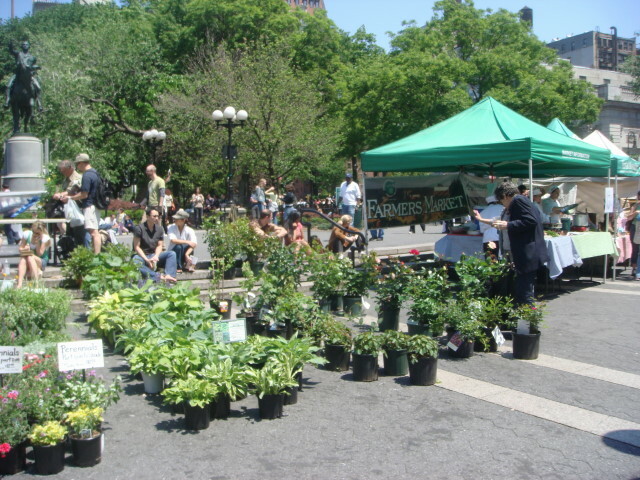 Union Square was having one of its regular farmers markets and plant/flower sales as I was going through it, and I happened upon a nice little place. Nothing special, just kind of your usual stall selling cheese. In this case, goat cheese. I’ve seen them before. What I hadn’t seen before were the proof of the cheese source: Goats. They were pretty skittish, but then this is a new land for goats. We don’t get much livestock in Manhattan, dontchaknow? Well, not nowadays. Go back a dozen decades and it would probably be a frequent sight. But this is a sight you wouldn’t have seen that dozen decades ago. And probably not last week, either. I honestly don’t know the purpose or reason or joke that’s being pulled here. For some reason, the figure looks familiar, but I don’t really recall seeing him/it before. Of course, you see all types in NYC. With regard to livestock (to revisit that topic for a moment). 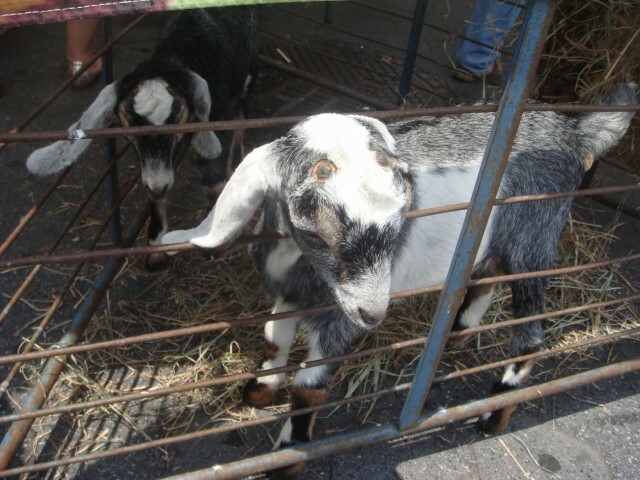 No, we don’t have livestock, but our farmers markets can have some game for sale. Not live, though. 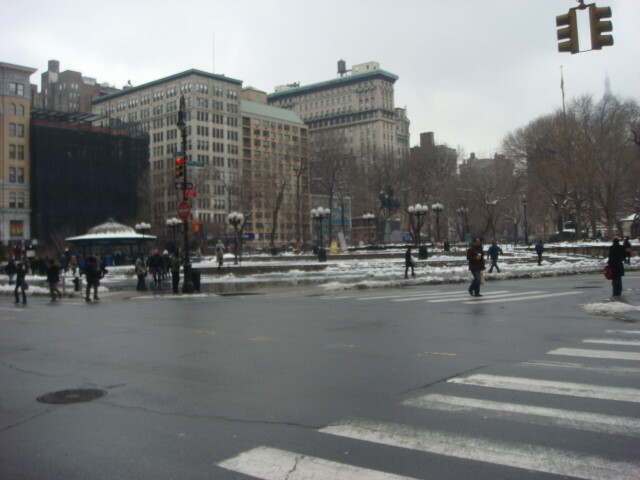 Last weekend, I decided to take a little trip by Union Square. Something’s always going on at Union Square. This time, one of the items was a flower market. Pretty impressive. 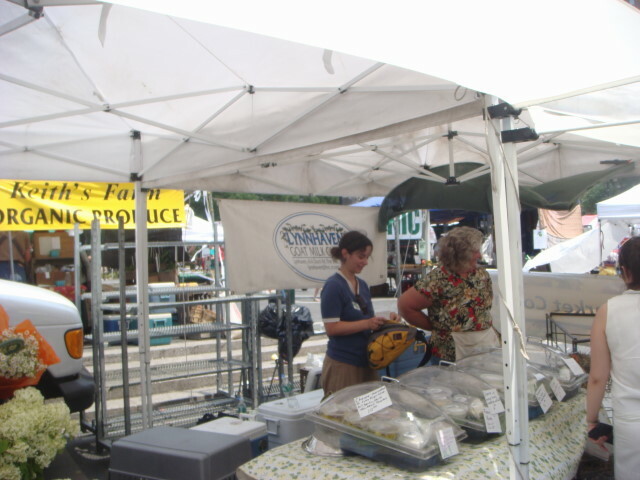 The weather was just fine and the local vendors were out in force. There were, of course, tons of flowers around; but in addition to them there were lots of the usual artists and, off to the side, the traditional farmers market. I’ve taken so many pictures of those crowds, I didn’t feel like doing another. Here’s more of the flower market vendors. Surprisingly, the free hugs at Union Square people were out again. Good for them, but the crowd seemed a little more standoffish this time. And there were fewer huggers. At the bottom left of the above picture, you can see some chalk writing. 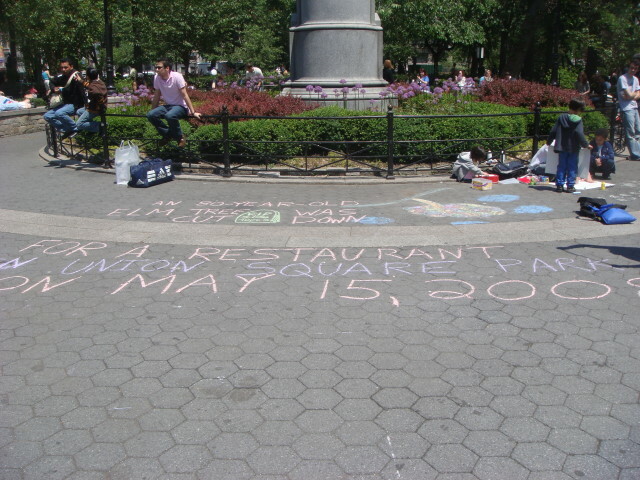 There was also an anti-restaurant-on-Union-Square protest going on. They were protesting the felling of a tree. I still haven’t seen the spot that they plan on building the restaurant. I just haven’t even thought about looking for it. In fact, it is probably so plainly visible that I’ve seen it and just haven’t even noticed. 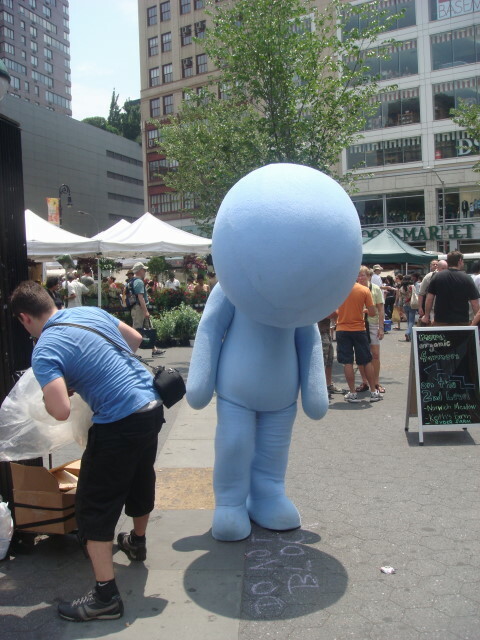 Yeah, there’s always something going on in Union Square. You probably missed it, but that’s why there’s a Famous Ankles. Free Hugs in Union Square last weekend. There were about eight or ten t-shirt clad huggers calling out their desire to bestow hugs to any and all. A few took them up on the offer and a whole bunch of us just appreciated their willingness to hug. I believe it was actually a political protest of some sort. A sort of “arms are for hugging and not for shooting” sort of thing, but that’s only because I saw one sign along those lines. I saw another saying “It’s my birthday, hug me” carried by another…so maybe it was…an anti-war birthday salute? Nah, it wouldn’t be a “salute”, just a hug-in (wow, that takes me way, way back). Anyway, happy birthday to her (unfortunately, not pictured). And thanks to the young lady in the first picture for a great pose. 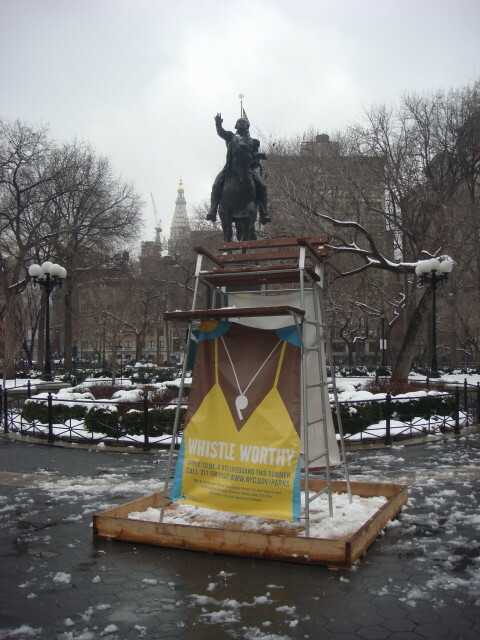 Yesterday, I did a post about an unusual protest last weekend in Tompkins Square Park that seemed to reference Union Square and Washington Square Park. 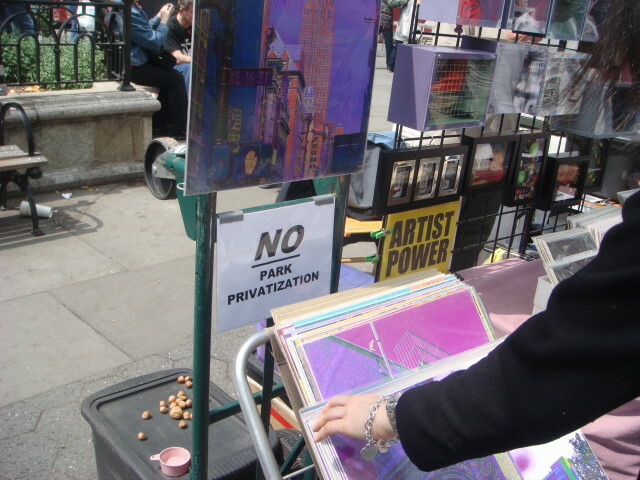 When I got to Union Square later that day, I found a sort of “silent protest” by the artistic types. 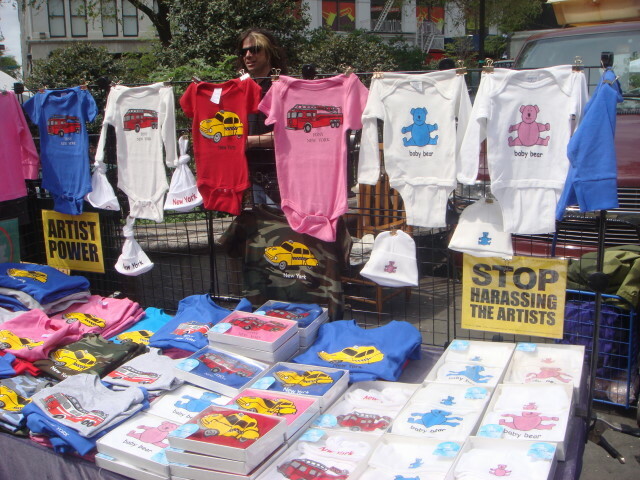 By “artistic types”, I mean the craftsmen selling their wares. It seemed to me that the authorities were starting to crack down on the protestors in Union Square, but that didn’t make any sense. 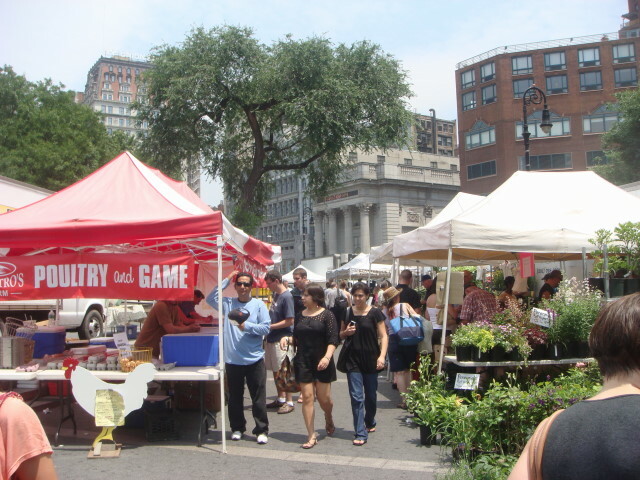 There was a farmers’ market going on and I can’t imagine that is under any City threat. But, then again, the protestors are always there and the farmers’ market is on Saturdays. And, of course, they aren’t all protestors. Lots of them are just selling their wares. If you noticed the above, there’s something about “park privatization”. 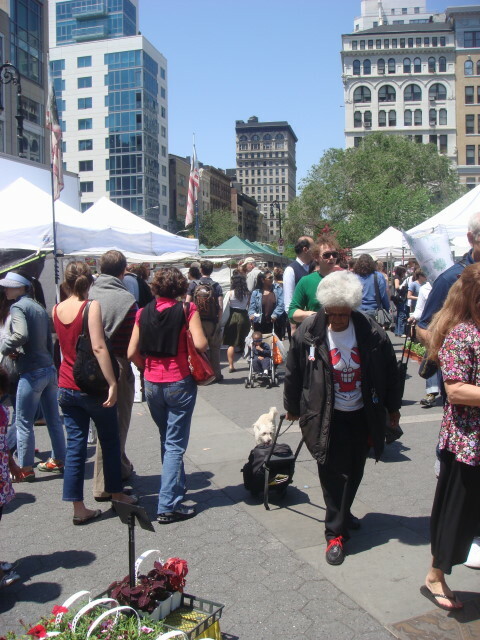 It seems to turn out that there is a move to bring in a restaurant onto Union Square and that this was an Arbor Day Protest in response to the possible cutting down of some trees to make way for a restaurant. Wow. I’ve seen many a protest, but never an Arbor Day one. 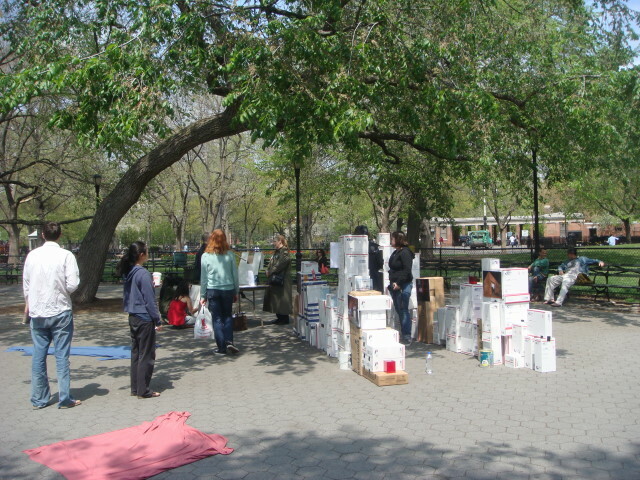 I was recently down in the Alphabet City area and wandered through Tompkins Square Park. While there, I saw a protest in progress at the southern part of the park. 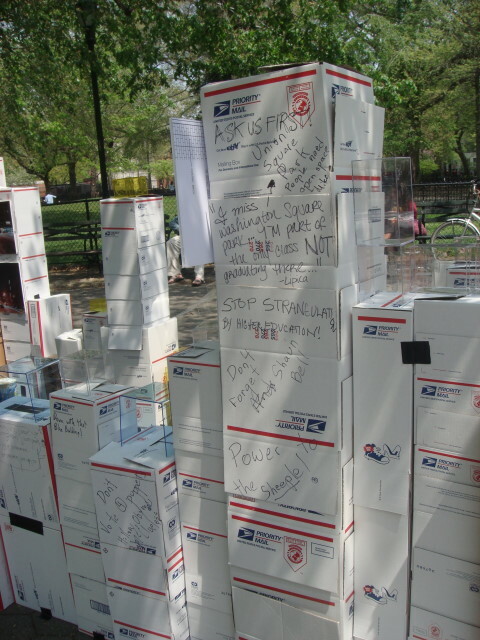 The protest seemed centered around a bunch of mailing boxes with slogans. Forgive me, but I couldn’t figure it out. 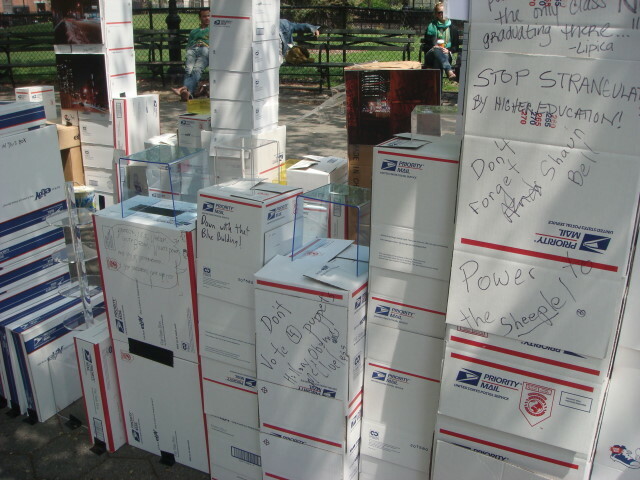 Some of the slogans were about Washington Square Park (undergoing renovations and no longer the center of protest activity). Others were about “stop strangulation in higher education” and “power to the sheeple”. I do know that there was another sort of “park protest” going on in Union Square (I’ll post on that separately), so there is a point to the protest. If I had to guess, the authorities (yeah, those guys) are starting to crack down on the protestors in Union Square just like they did in Washington Square Park. That’s sad, if only because there are a lot of New Yorkers who really, really, really need a place to do their rants. 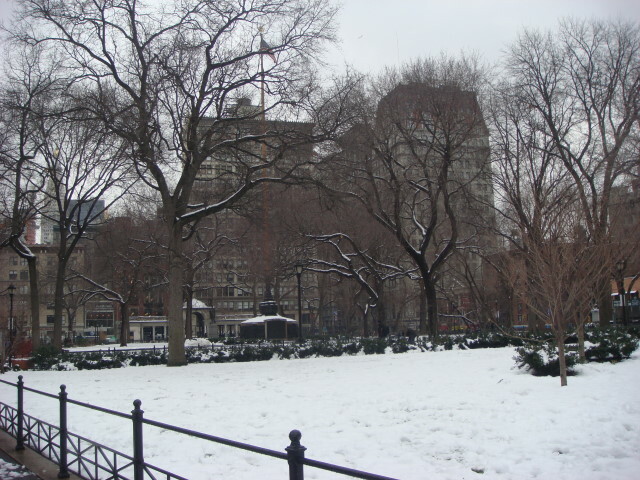 Friday’s snowfall affected Union Square on Saturday, at least to some extent. On weekends, even in the dead of winter, there’s always something going on there. But when I walked through there on Saturday, I got the definite feeling that very little was happening. Just wet and slushy. 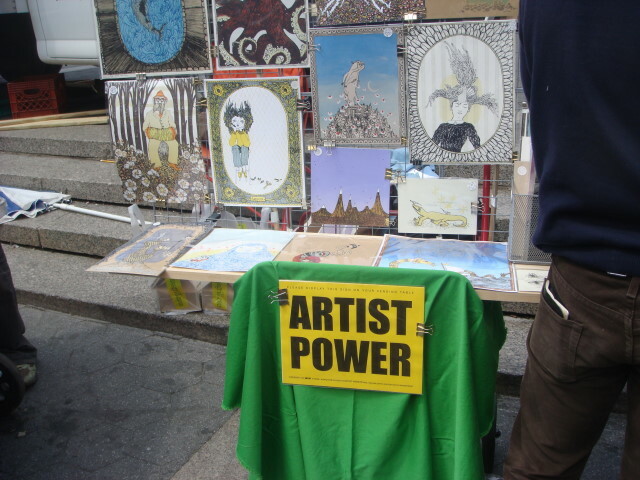 There was just the tiniest hint of current snow in the air, so I expected that the artists wouldn’t be out peddling their wares. And for the most part, that was correct. The guys below were just about the only ones there. But the dogs were there (as you would expect). And the farmers market was going strong. The prettiest part of the walk through was the actual park. There was still plenty of snow on the ground. But the interesting part was right smack in the middle of the square itself. Just a plaintive little display showing that hope for a better tomorrow lurks just beneath the surface. It’s an ad for lifeguards for this summer. It’s looking for “whistle worthy” East Coast versions of David Hasslehoff and Pamela Lee.